Semisweet Dark Chocolate [Evaporated Cane Juice, Chocolate Liquor (Processed with Alkali), Cocoa Butter, Milk Fat, Soya Lecithin (An Emulsifier), And Vanilla], Organic Honey, Whey Protein Isolate, Almond Butter, Dried Sour Cherries (Cherries, Apple Juice, Sunflower Oil), Almonds, Vitamins & Minerals (Dicalcium Phosphate, Magnesium Oxide, Ascorbic Acid (Vit C), Cholecalciferol (Vit D), Alpha-Tocopherol Acetate (Vit E), Biotin, Zinc Oxide, Niacin, Ferrous Fumarate (Iron), Molybdenum Glycinate, Calcium Pantothenate, Copper, Manganese, Beta Carotene (Vit A), Selenium, Pyridoxine (B6), Riboflavin (B2), Thiamine (B1), Chromium, Cyanocobalamin (B12), Folic Acid, Potassium Iodide), Natural Flavor. Semisweet Dark Chocolate [Evaporated Cane Juice, Chocolate Liquor (Processed with Alkali), Cocoa Butter, Milk Fat, Soya Lecithin (An Emulsifier), And Vanilla], Organic Honey, Whey Protein Isolate, Almond Butter, Coconut, Almonds, Vitamins & Minerals (Dicalcium Phosphate, Magnesium Oxide, Ascorbic Acid (Vit C), Cholecalciferol (Vit D), Alpha-Tocopherol Acetate (Vit E), Biotin, Zinc Oxide, Niacin, Ferrous Fumarate (Iron), Molybdenum Glycinate, Calcium Pantothenate, Copper, Manganese, Beta Carotene (Vit A), Selenium, Pyridoxine (B6), Riboflavin (B2), Thiamine (B1), Chromium, Cyanocobalamin (B12), Folic Acid, Potassium Iodide), Natural Coconut Flavor. Organic Honey, Dark Chocolate [Evaporated Cane Juice, Chocolate Liquor (Processed with Alkali), Cocoa Butter, Milk Fat, Soya Lecithin (An Emulsifier), And Vanilla], Whey Protein Isolate, Almonds, Vitamins & Minerals (Dicalcium Phosphate, Magnesium Oxide, Ascorbic Acid (Vit C), Cholecalciferol (Vit D), Alpha-Tocopherol Acetate (Vit E), Biotin, Zinc Oxide, Niacin, Ferrous Fumarate (Iron), Molybdenum Glycinate, Calcium Pantothenate, Copper, Manganese, Beta Carotene (Vit A), Selenium, Pyridoxine (B6), Riboflavin (B2), Thiamine (B1), Chromium, Cyanocobalamin (B12), Folic Acid, Potassium Iodide), Natural Oil of Peppermint. Semisweet Dark Chocolate [Evaporated Cane Juice, Chocolate Liquor (Processed with Alkali), Cocoa Butter, Milk Fat, Soya Lecithin (An Emulsifier), And Vanilla], Organic Honey, Whey Protein Isolate, Almonds (almond butter and slivered almonds), Dried Sour Cherries (Cherries, Apple Juice, Sunflower Oil), Vitamins & Minerals [Dicalcium Phosphate, Magnesium Oxide, Ascorbic Acid (Vit C), Cholecalciferol (Vit D), Alpha-Tocopherol Acetate (Vit E), Biotin, Zinc Oxide, Niacin, Ferrous Fumarate (Iron), Molybdenum Glycinate, Calcium Pantothenate, Copper, Manganese, Beta Carotene (Vit A), Selenium, Pyridoxine (B6), Riboflavin (B2), Thiamine (B1), Chromium, Cyanocobalamin (B12), Folic Acid, Potassium Iodide], Coffee, Natural Flavor. Organic honey, milk chocolate [evaporated cane juice, cocoa butter, whole milk, chocolate liquor, soya lecithin (an emulsifier), salt and vanilla], peanut butter (dry roasted peanuts, palm oil and salt), whey protein isolate, vitamins and minerals [dicalcium phosphate, magnesium oxide, ascorbic acid (vit C), cholecalciferol (vit D), alpha-tocopherol acetate (vit E), biotin, zinc oxide, niacin, ferrous fumarate (iron), molybdenum glycinate, calcium pantothenate, copper, manganese, beta carotene (vit A), selenium, pyridoxine (B6), riboflavin (B2), thiamin (B1), chromium, cyanocobalamin (B12), folic acid, potassium iodide], salt. Allergen Statement: contains milk, soy, peanuts and other tree nuts. May contain egg and wheat. Organic Honey, Milk Chocolate [Evaporated Cane Juice, Cocoa Butter, Whole Milk, Chocolate Liquor, Soya Lecithin (An Emulsifier), Salt, And Vanilla], Peanut Butter (Dry Roasted Peanuts, Palm Oil And Salt), Whey Protein Isolate, Vitamins & Minerals (Dicalcium Phosphate, Magnesium Oxide, Ascorbic Acid (Vit C), Cholecalciferol (Vit D), Alpha-Tocopherol Acetate (Vit E), Biotin, Zinc Oxide, Niacin, Ferrous Fumarate (Iron), Molybdenum Glycinate, Calcium Pantothenate, Copper, Manganese, Beta Carotene (Vit A), Selenium, Pyridoxine (B6), Riboflavin (B2), Thiamine (B1), Chromium, Cyanocobalamin (B12), Folic Acid, Potassium Iodide), Salt. Not your ordinary protein bar! Truly a great-tasting meal replacement snack or after workout recovery bar. 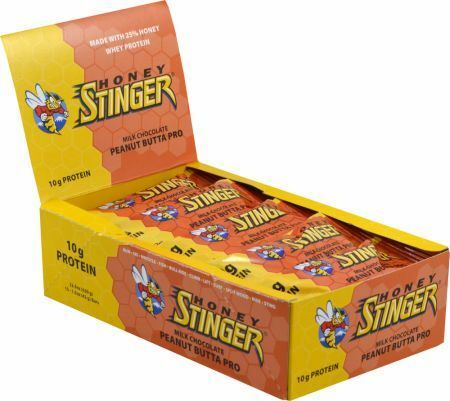 Honey Stinger protein bars are gluten free and contain no trans fats. Our protein bar is truly unique as we include over 25% USDA certified organic honey, 10 grams of whey protein – almost 20% of the daily recommended allowance, 23 vitamins and minerals, calcium and antioxidants.